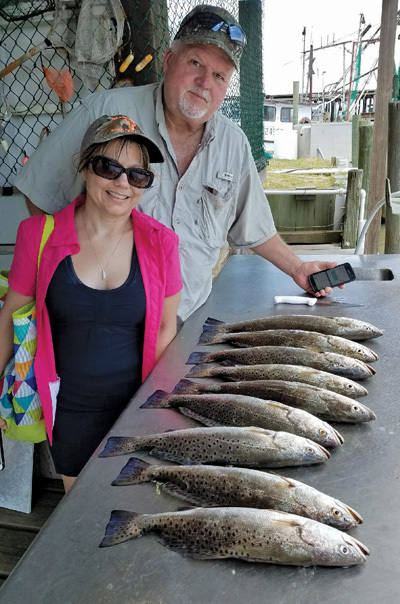 Marion and Shelia Hixon with some nice trout after a quick trip with Capt. Dillman. This May we experienced some below average air temperature and plenty of wind. Not from the usual S/SE but more N/NW due to late season cold fronts. 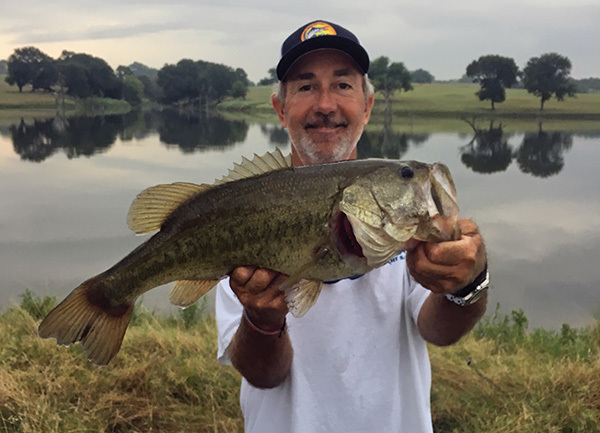 The below normal water temperature kept our fishing at a not so typical pattern. 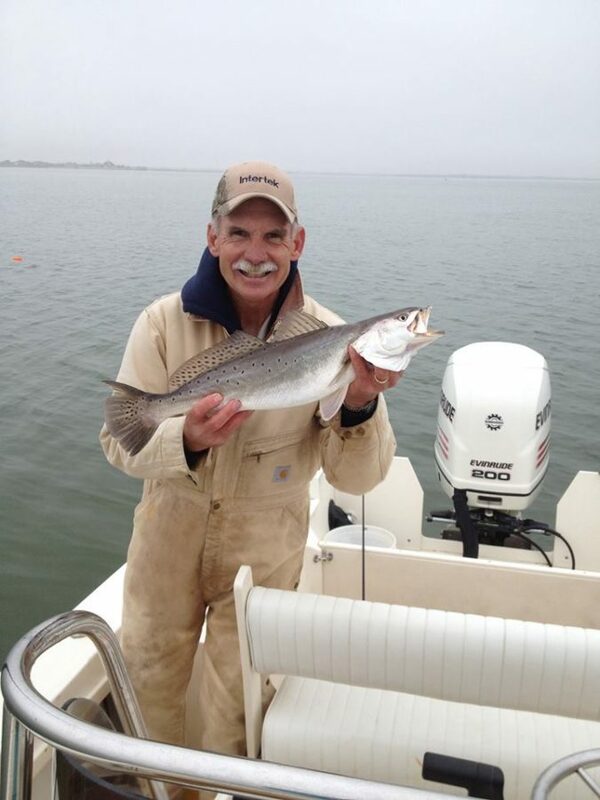 But we should see a summer pattern develop for speckled trout this July and August in Galveston Bay. 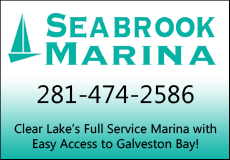 In July, look for the trout action to center around the middle of Galveston Bay. I would concentrate my effort through channel markers 50-66. There are numerous oyster reefs adjacent to the channel. While some of these reefs are marked with PVC pipe, many are not. 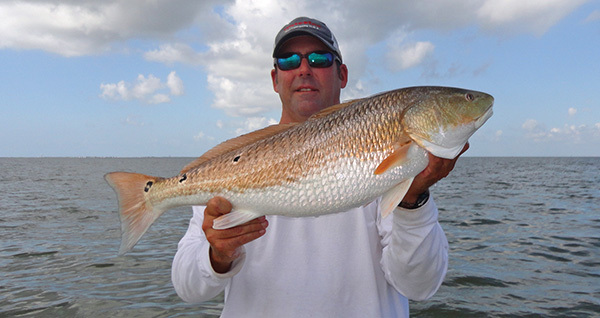 Being able to utilize a good depth sonar will aid you in finding the smaller shell reefs. There are numerous gas wells in the immediate area. The wells should not be overlooked as the trout will congregate around the wells and their shell pads. The Exxon A-Lease draws the most attention but don’t overlook the other scattered gas wells. 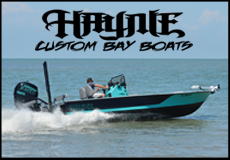 As we roll into August, look for the trout to move farther north up the channel and into Trinity Bay. Channel markers 68 and up, all the way towards the tip of Atkinson Island will hold fish. 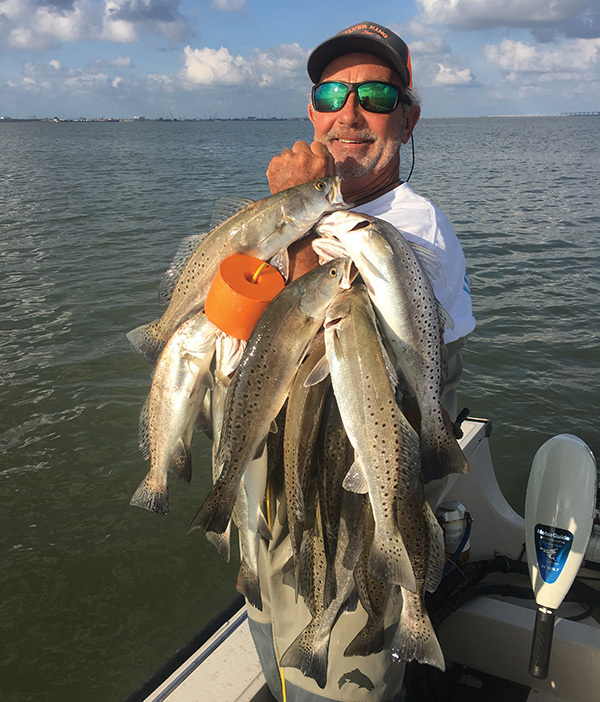 As the fish move farther into Trinity, the numerous shell reefs and wells will see a influx of trout. 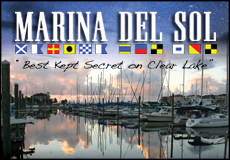 Some of the most popular reefs are Dow, Beazley’s, Fisher Shoals and Trinity Reef. 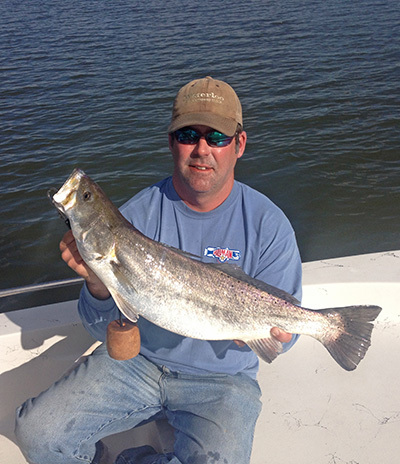 The wells located in close proximity to these reefs will also be good for speckled trout. 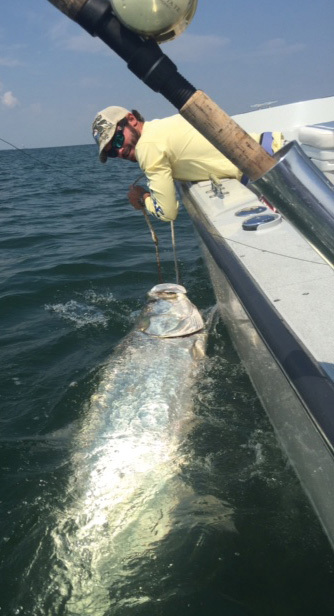 Depending upon the salinity of Trinity, the fish will continue to move farther back in the bay sooner than normal. 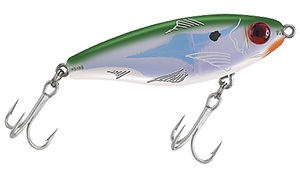 I have caught fish in the Jacks Pocket area in late August on occasion. 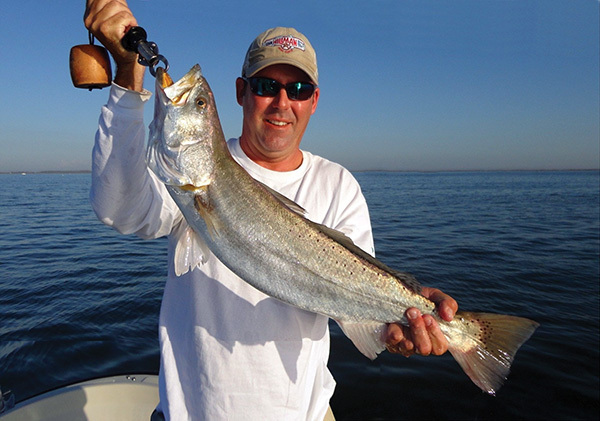 Speckled trout will feed on either the topside or backside of a reef or shell pad depending upon the tide. At times they may even be found directly on top of the shell, which usually occurs during a slack tide. 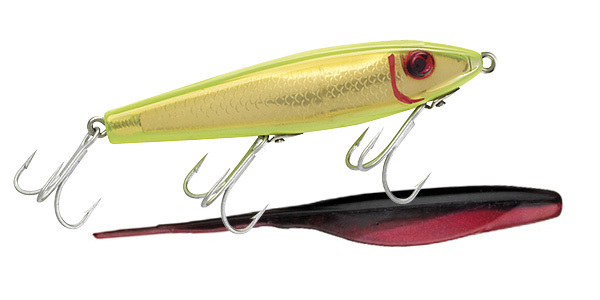 Utilizing live bait in the heat of the summer is the most effective way to catch these fish. 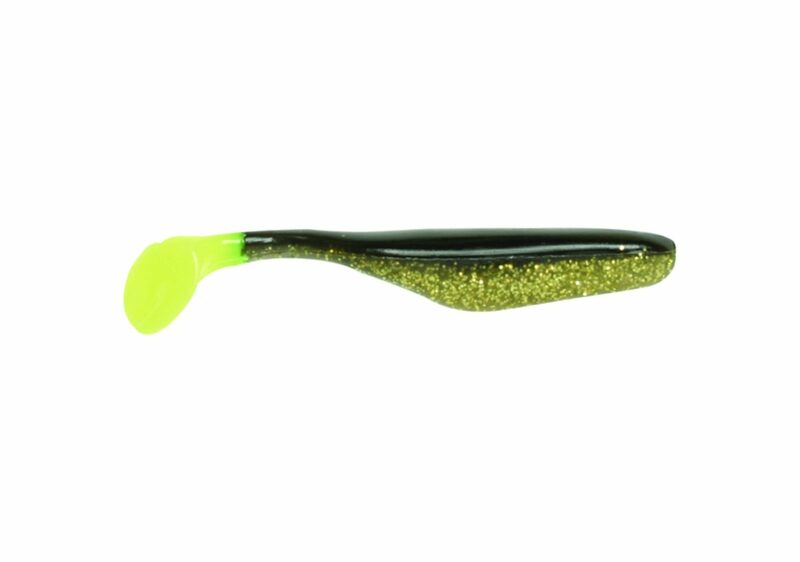 Live croaker, fished either Carolina or Texas rigged is the most effective, followed by live shrimp fished deep under a popping cork. 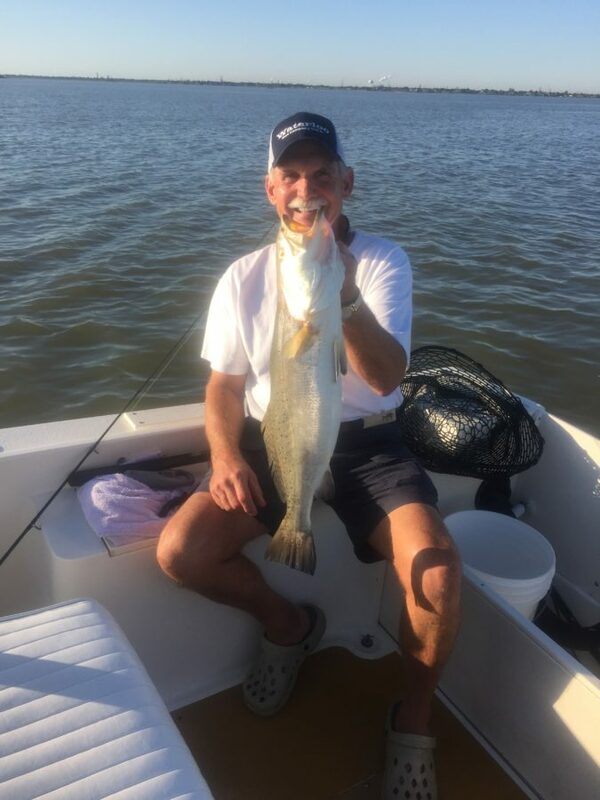 Eagle Point Fishing Camp always holds a good supply of both croaker and live Shrimp. Please remember that it can get really hot on the water these next two months. Wear light colored, loose fit clothing and drink plenty of water. Gatorade type drinks are okay but should be followed up by consuming 2 equal parts of water. Alcohol and energy drinks should be avoided, as well as soft drinks. They only aid in dehydrating your body. 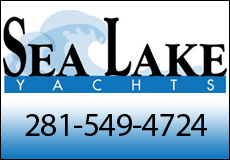 As always be careful on the water.